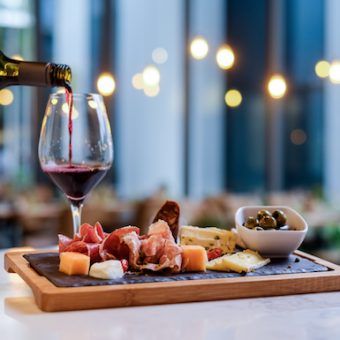 Winestone is a Modern European restaurant, late-night bar and wine retail store, serving affordable wines and authentic European cuisine. Dishes served take on their inspiration from the coast of the Mediterranean sea, the delicious tastes of France, the hearty homely meals of Italy and the gastronomic wonders of Spain. The name of the restaurant reflects the idea of the outlet, a new distinguishing concept with two elements: the wine selection created out of the experience and the knowledge of its wine ambassadors and signature meals served on stone boards. The concept of Winestone revolves around the key words: simple, attractive, authentic and affordable. Expect quality wines at affordable prices, from $6 for a glass and $48 for a bottle. Take-home wine is also made available at Winestone Retail, located within the restaurant, with a separate entrance to the driveway. Serving a unique range of Modern European dishes such as authentic Mediterranean platters made only from the finest and freshest ingredients, the signature “Winestone Express Platter” is served promptly (within 15 minutes) for the early and hungry. Experience Italy with the traditional and chef recommended Ragout, which promises to leave that ‘Mama Mia!’ sensation with every bite. Other signatures include Grass-Fed Roasted Lamb, Natural Pasture-fed MS2+ Ribeye and Cataplana. Call 6491 6100 or email H9561-FB4@accor.com to reserve a table. A cosy European restaurant nestled in the lush urban resort that serves individually plated modern European cuisine. Perfect for a wedding lunch or dinner, Winestone is lit with warm and modern lighting, creating a romantic yet unforgettable evening as you dine and dance the night away in celebration.